I looked and looked on the internet for a some what affordable and attractive rocker for the nursery. There is not very much out there. My wife and I first decided on the HEJKA rocking chair at Ikea though it was not meant to be. We live 3 hours from an Ikea and stopped while we were in the area. Unfortunately this chair does not fit into a mini cooper. There was a moment of absolute euphoria when the whole chair was in the car and a family of five, who had been watching me playing furniture tetris, walked from a mini van and the mom said in amazement, "Look he got it to fit!" It was great until I tried to sit in the drivers seat, no chance for this tall guy. 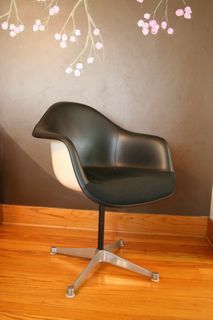 We were very lucky to find two cloth/vinyl Herman Miller armshell chairs at the local office furniture place. We ordered two rocking bases from ebay. One base was powder coated black and one zinc coated. All the types of bases for this chair are interchangeable. The toughest part was finding someone to recover the one chair to match the baby's room. No furniture places in the area would touch this chair. There is a company that recovers them online, but in the end we were able to find a shop that does car upholstery locally and it was actually no problem for the shop to do. When they took off the cover and the fiberglass edges of the chair were rough and unfinished. Even if we wanted to make it look like a plain fiberglass chair I don't think that would have been possible. They cut new foam for the chair and they had all the vinyl in stock and even had metal lined banding that hooks around the chair edge. It took about a week for them to finish the chair. The new foam made all the difference in making it a more comfortable chair for nursing the baby. The rocker bases fit perfectly and only took a few minutes to attach. Now that the chairs are done they both look great. Modern art that is functional! What more could you ask for? I'm very happy with the end result of the chairs. Unlike the wicker Ikea chair, I know that this chair will only appreciate in value and you never know, this could be one of those items that gets handed down within our family from generation to generation. So pretty! 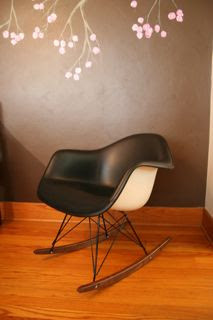 I love Eames furniture. I just got an Eames Lounge Chair and Ottoman and am proud to say I have a legitimate piece of artwork in my house! 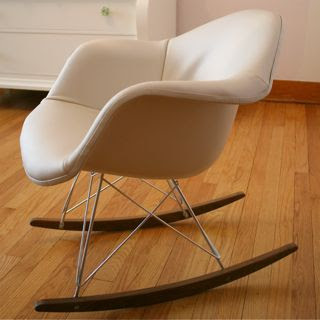 I want to buy a Saarinen chair and I'm thinking I'm going to buy it from the first place I bought my chair, officedesigns.com, because they were so knowledgeable and friendly, plus they shipped it to me for free. 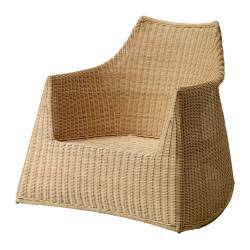 I like the rocker though because its got a more at-home-feeling to it. the chair looks amazing with the cushioning. I am in the middle of ordering the chair and was trying to find ways to cushion it, as it is not upholstered. Is there anyway to obtain teh website you mentioned recovers the chairs or if the car upholstery shop is located within new york or ny? 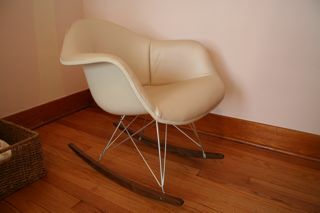 I got mine done at C & J Upholstery in IL you can also try http://www.humemodern.com They are located in CA though. I believe they were both the same price, but the local one was able to get it done in a week. I bought an armshell and the rocker base but am stuck finding the right screws to mount the rocker onto the shell. I have tried Home Dept. but no luck. The armshell has the original shock mounts, (it's branded with the c and star symbol) which look like they are in good condition, I just need some screws. Any suggestions on where to find them and what size??? Type your comment here.Very interested in the car upholster. Where did you get it upholstered in Illinois. It was upholstered in Rock Island, IL. I can't remember the name of the place but if I pass by it I'll try to post it. They really did a good job. I think it is a really view point. I meet people who rather say what they suppose others want to look good writing. Surely, I will come back to your site!